The World’s Best Fuel: COFFEE!!! I know, I went overboard, this blog post is way too long. But if you drink coffee, you are going to enjoy it very much. I’m going to cover all the steps necessary to provide you with a tasty cup, and give you some background on caffeine. So poor yourself a cup and let’s start. Coffee is of major importance culturally, economically and historically. Arabs were the first to bring coffee to a commercial scale after its introduction in the Arabian city of Moka. They still make some of the best coffee in my opinion. In Europe, many historians have argued that the age of enlightenment and the scientific, social and political revolutions that followed were in part due to the arrival of coffee. You won’t really plan a revolution and dream of democracy when you’re imbibing yourself with beer, wine or hard liquor. Generally, you just want to hit your neighbor or laugh at terrible jokes. A group of people talking around a cup of coffee have way better chances of coming up with the Theory of Evolution, or of proposing that governments should receive their mandate from the people. Today, coffee is a major part of a student’s and of a scientist’s lives (or anyone that does anything productive). There is no way you can pull an all-nighter and sit through a lecture the next morning without caffeine. Coffee is AWESOME! Ok, tea is awesome too and is also consumed by a ridiculous proportion of Earth’s inhabitants. Well, I’m in Panamá and Panamanians grow coffee. Therefore, coffee is today’s subject. Let’s start with a few numbers. Which country produces the most coffee? Brazil does, 1.55 billion kilos of it every year. Vietnam and Colombia follow. Who drinks the most coffee? You’re probably thinking Italians. No! That would be people from Finland (12.0 kg per person per year), Norway (9.9), Iceland (9.0), Denmark (8.7), the Netherlands (8.4), Sweden (8.2), Switzerland (7.9), Belgium (6.8) and Canada (6.5). Have you noticed? Most of these countries are freezing cold! 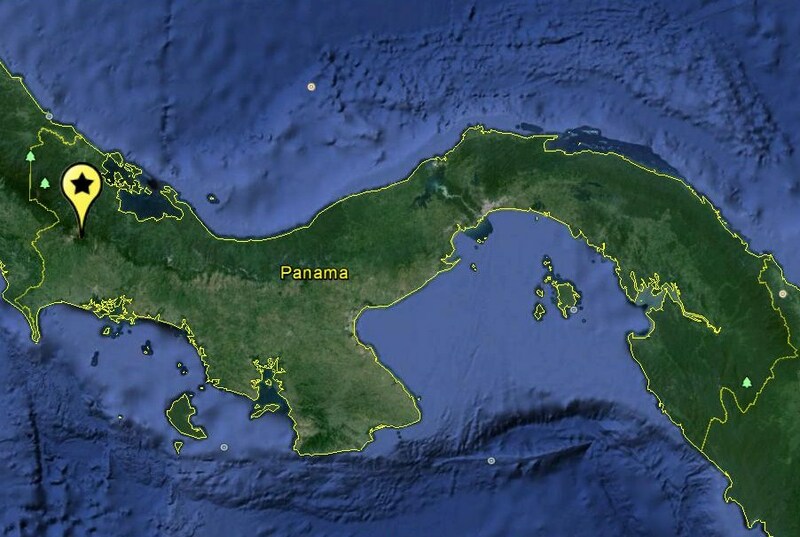 Panamá is the 37th producer in the world with only 6 million kilos annually. 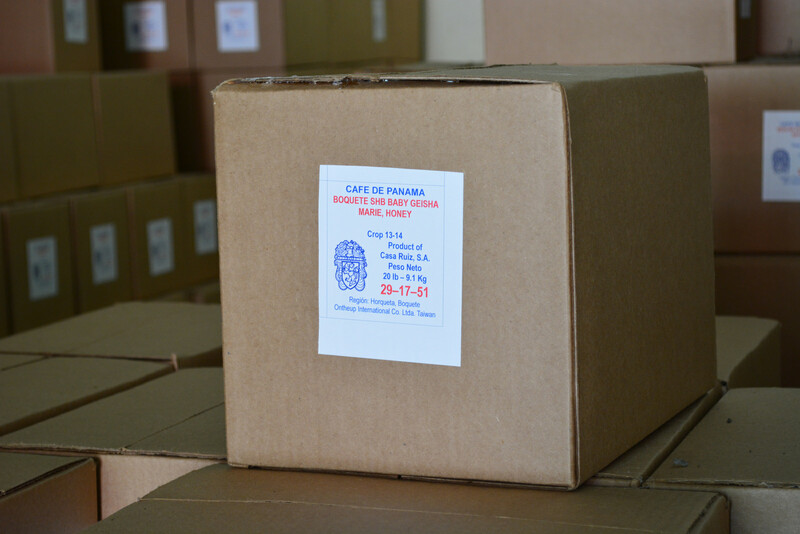 Even if the production is small, Panamanian coffee is considered one of the very best. 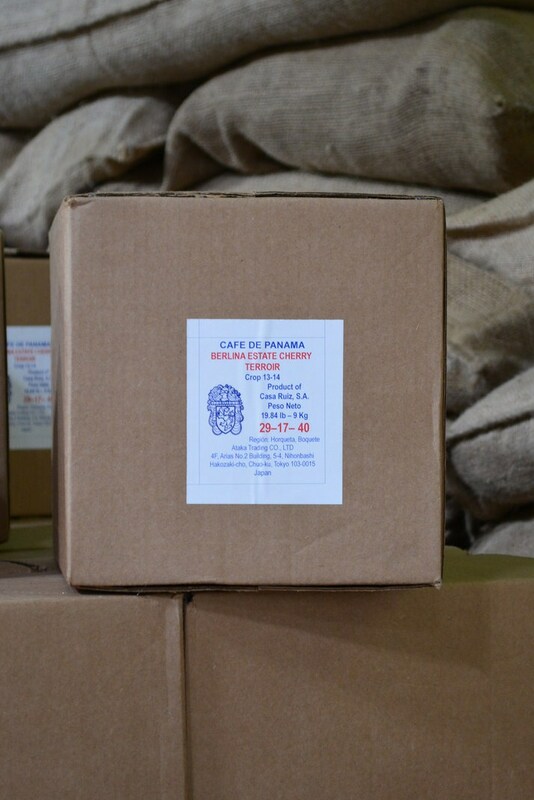 Panamanians are not big coffee drinkers, as each Panamanian only consumes 1.2 kg per year. If you are American, multiply all those numbers by 2.2 and you shall have pounds. Map of Panamá showing the location of Barú Volcano. 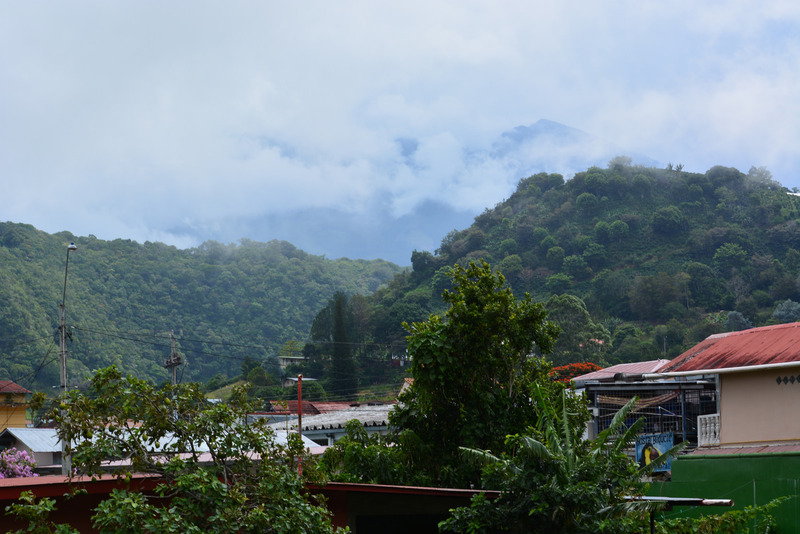 The village of Volcán is located on the Western slope while Boquete is on the Eastern side (Copyright: 2014, Google). Last weekend, I travelled with a few friends to the province of Chiriquí, in Western Panamá. This province is home to Panamá’s only active volcano, Volcán Barú, and to virtually all of the country’s coffee producers. Barú’s last major eruption dates back to 500 AD and a minor eruption occurred in 1550 AD. Thanks to the volcanic deposits, the valleys surrounding the volcano are extremely fertile. These valleys are also quite high in elevation. The volcano itself reaches 3,475 meters (highest point in Panamá, you can see both the Pacific Ocean and the Atlantic Ocean from its summit on a clear day) and the surrounding towns of Volcán and Boquete are located at respectively 1,400 and 1,200 meters above sea level. The climate in these two villages is quite comfortable year-round with afternoon temperatures reaching 26°C, and nighttime temperatures averaging 15°C. Considering that the rest of Panamá is suffocating, no wonder lots of rich Panamanians and ex-pats have their vacation houses there. Even if the coffee tree is a tropical shrub, the plant actually likes colder climates and really rich soils. Therefore, Chiriquí is perfect for coffee production. 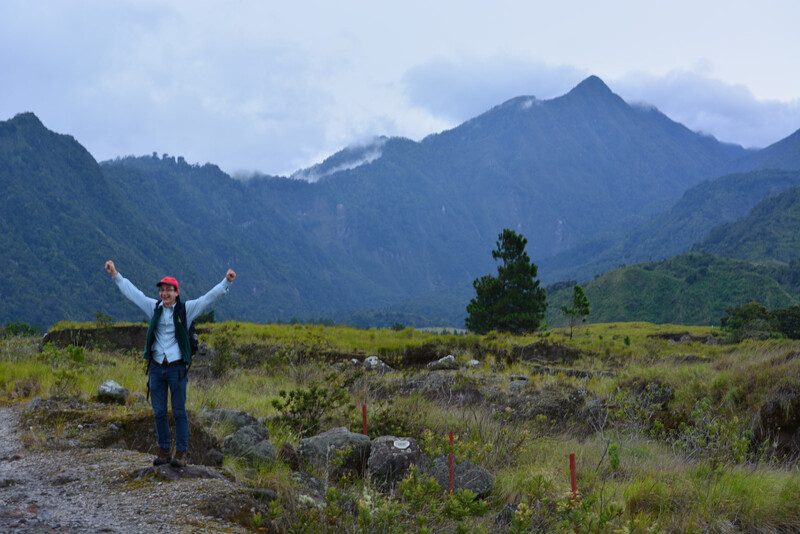 At the foot of the highest point in Panamá, Barú Volcano (3,475 meters). This picture was shot from the village of Volcán. The hike takes a full day, so we did not try. I’m leaving it for next time (Photo: Geneva Nam). Barú Volcano hiding behind the clouds. At the forefront, you can see the roofs of the charming village of Boquete (Photo: Nicolas Chatel-Launay). To understand how coffee is made, we visited the plantations and facilities of the Casa Ruiz, a business owned by the Ruiz family since 1920. Recognized as one of the finest coffee producers of Panamá, many of its coffees (they have 11 plantations around Boquete and they don’t mix the harvests) have won international prizes and can be found in high-end coffee stores of Europe, Asia and North America. They don’t sell coffee to these countries, they auction coffee. That’s how good they are. I’ve tasted a few of theirs, and trust me, their coffees are REALLY, REALLY GOOD! The vast majority of coffee producing countries pool their coffees into one big corporation or cooperative. It is the case in Colombia and in Costa Rica. 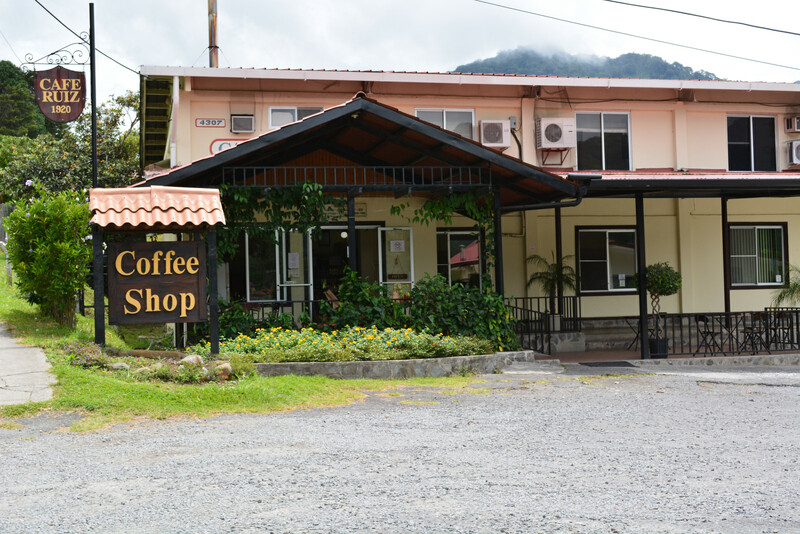 In Panamá, each grower, however small, markets its coffee independently. So really, it’s just like French wine. Every estate will produce a distinct flavour and some of these estates are little marvels. Panamá doesn’t produce better coffee than everyone else for some biological or geographical reason. The coffee is just marketed differently, and when you happen to fall on a really good estate in Panamá, it’s grains don’t get mixed with those of a crappy estate. The headquarters of Casa Ruiz, a family business since 1920 (Photo: Nicolas Chatel-Launay). Coffee comes from Ethiopia. It grows mostly on two species of tropical shrubs Coffea arabica (usually referred to as Arabica) and Coffea canephora (the one you know as Robusta). Some other Coffea spp. species are also cultivated, but we are really talking low production here. Robusta is called “robust” because the plant is more resistant to heat, diseases, and overall harsher conditions, it does not make stronger or better coffee. Actually, it’s with Robusta that instant coffee is made. Arabica produces the best quality coffee, but the plant is more fragile and more tricky to grow. In Panamá, people grow exclusively Arabica because the soils and climate of Chiriquí are just perfect for it. Once they reach five years old, shrubs bear pretty white flowers that, after insect pollinators do their job, turn into little red berries. 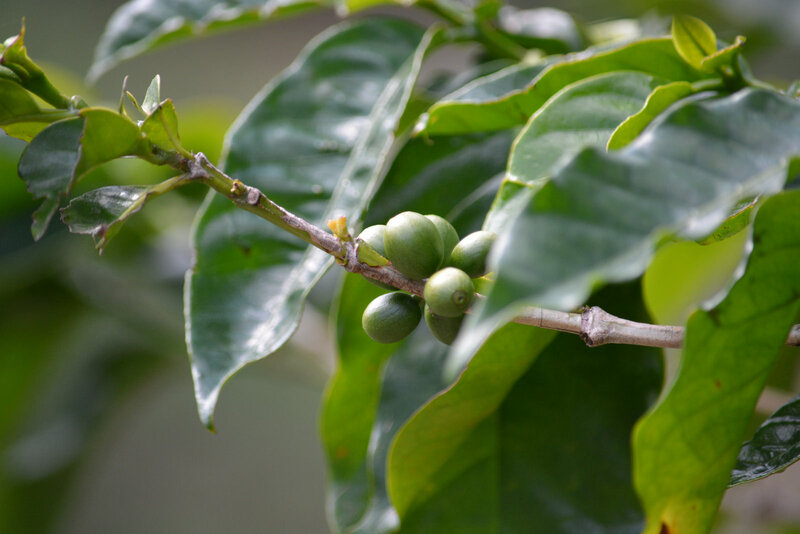 A coffee tree will keep producing for over a century and coffee quality tends to improve with time. Remember, Ruiz was founded in 1920. Each berry contains two seeds, although sometimes there is only one seed which will appear more round than a normal coffee grain. Each seed is at the source of caffeinated goodness. You can always eat the berry directly. I did, the most similar thing I could find is a mix between a raisin and a cranberry, quite good actually. Each plantation will have different soil acidity and fertility, the rainfall and temperature will change with elevation, soil humidity will vary depending on slope and soil type, shade will vary tremendously if a slope faces East or South. The 11 plantations managed by Ruiz around Boquete, are all located at different altitudes, have different microclimates and are planted with different Arabica cultivars. 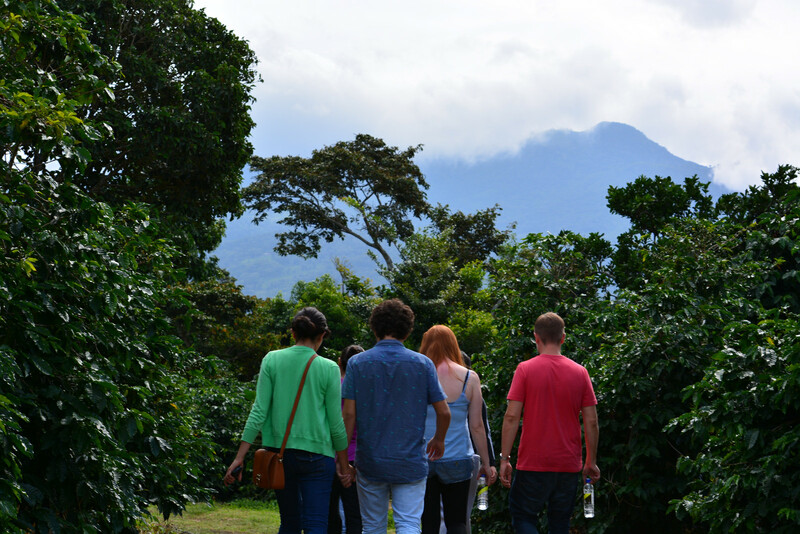 Each estate of the Ruiz company produces radically different coffee. For that reason, at the exception of some house blends, most coffee berries are never mixed and coffees are marketed by estate, cultivar, processing method and roasting. So let’s explore the latter two, processing and roasting. One of Casa Ruiz’s plantations in Boquete (Photo: Nicolas Chatel-Launay). We begin the path the coffee grain takes to go from the shrub, to your stomach, with the berry. Coffee berries are always hand-picked, because each berry of a single shrub ripens at a different time, a machine is therefore useless (ok, they do it in Brazil, but it produces a lot of waste). In Panamá, most of the work is done by the Ngöbe-Buglé natives that leave their reserve for the harvest season to work on plantations (December to March). Don’t worry, at Casa Ruiz, they are paid, housed in proper accommodations with their families and the company covers healthcare for workers and their families. The minimum age to work in a plantation is 15. I really doubt that every producer is that responsible, but Ruiz coffee sells so expensive that they can do it. Casa Ruiz even built a grocery and convenience store for their workers with regular Panamanian prices (because everything else in Boquete is now really expensive because there are so many rich people). Back to berries, they were picked, they now have to be “floated” in water. Unripe, bad or empty berries will float, good ones sink. Good berries are squeezed to extract the seeds. Seeds are then fermented for a day or two, which reduces the sugar content and brings in new flavours. What’s left of the pulp is then washed off from the seed along with one additional membrane surrounding the seed. Coffee beans then get pre-dried and dried. All coffee berries ripen at a different time. We know they are ready when they are completely red (Photo: Nicolas Chatel-Launay). 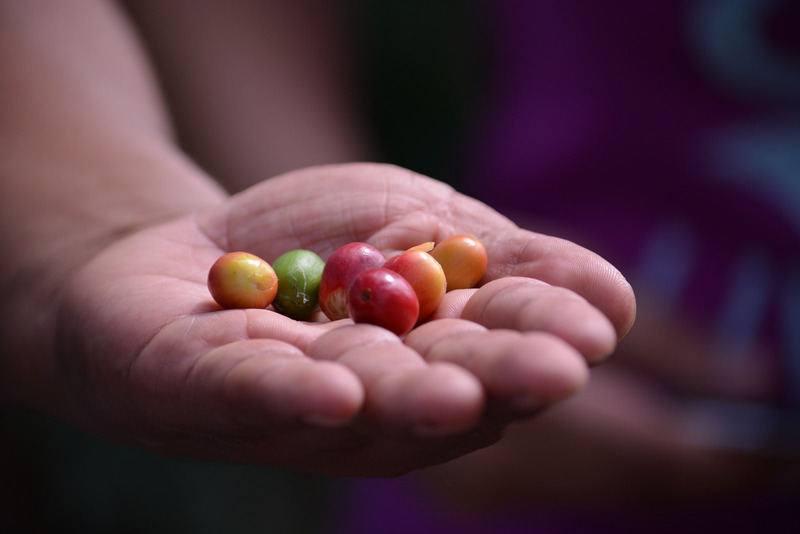 Each coffee berry contains two seeds, each with the potential of growing into a new coffee tree (Photo: Nicolas Chatel-Launay). 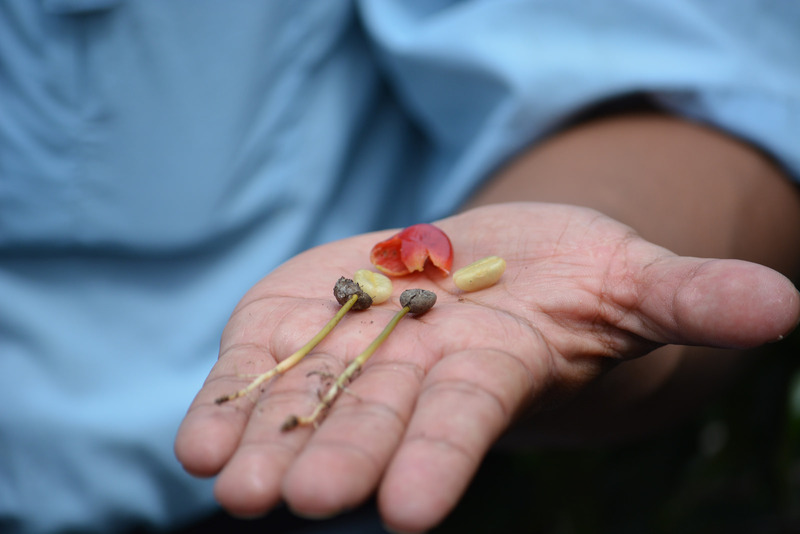 Carlos tells us all there is to know about coffee drying (Photo: Nicolas Chatel-Launay). That was what is called a wet process. A few other processes exist. One of them is natural drying or dry process. The fruits are picked and left to dry in the sun without any fermentation. This “natural” coffee will be a lot sweeter and is considered of better quality. But, that also comes with a risk, these beans will have to spend a few weeks outside, and if it rains, the harvest is lost. Therefore, “natural” coffee tends to be more expensive. Coffee can also be produced through a hybrid semi-dry process which makes sweeter coffee than the dry process, but not as sweet as the natural process. 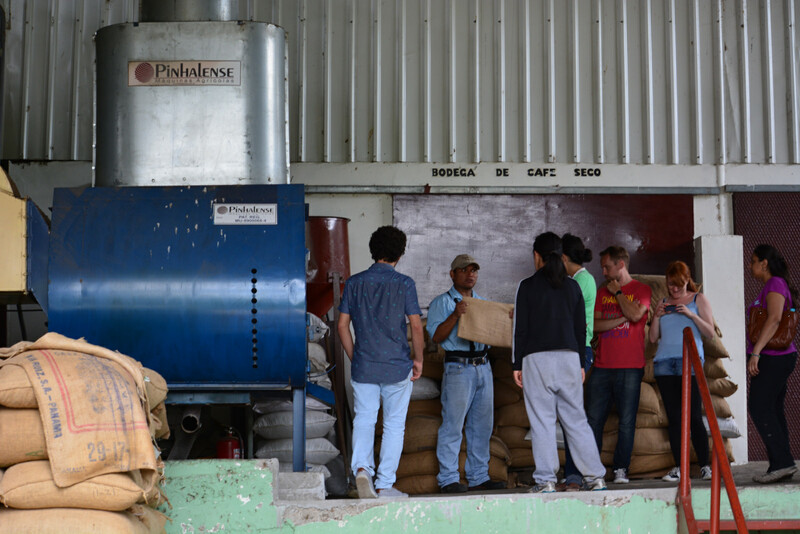 At Ruiz, the three kinds of processes are used to produce different coffees (obviously sold at different prices). 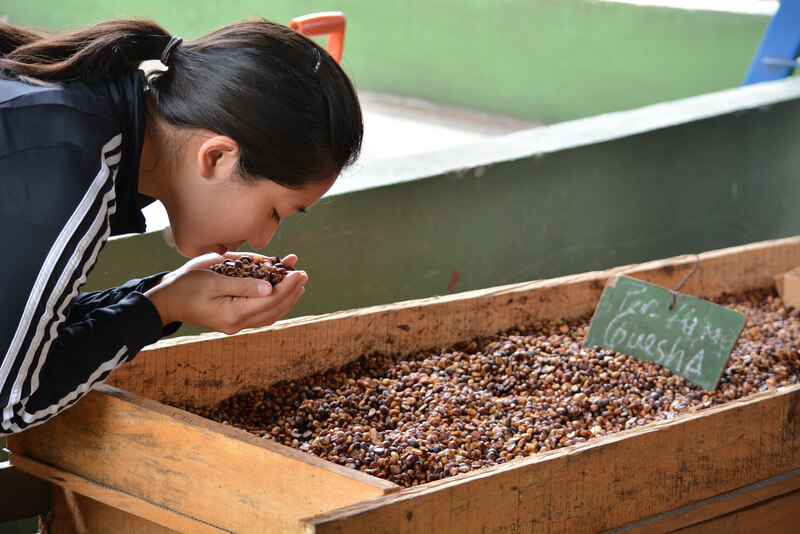 Coffee processed using a semi-dry process (referred to as “Honey”) keeps part of its pulp until the final wash. Geneva finds the smell delicious (Photo: Nicolas Chatel-Launay). 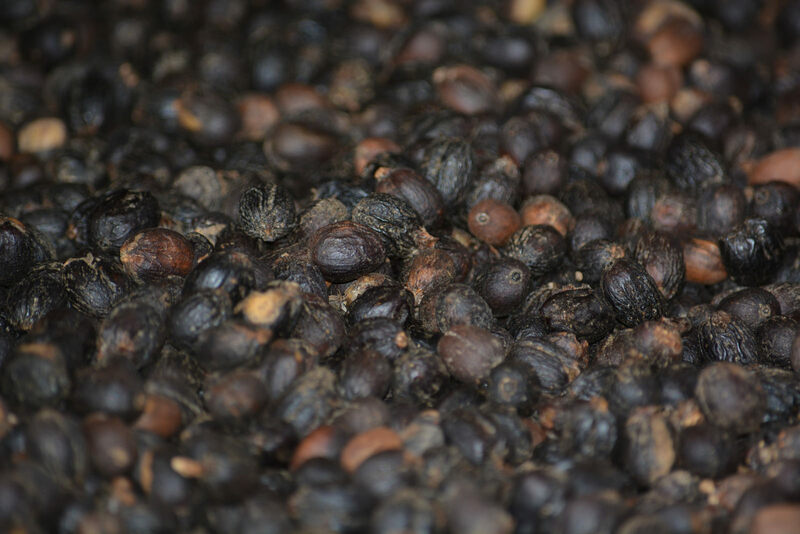 Natural coffee (referred to as “Cherry”)remains in the berry for most of the process (Photo: Nicolas Chatel-Launay). 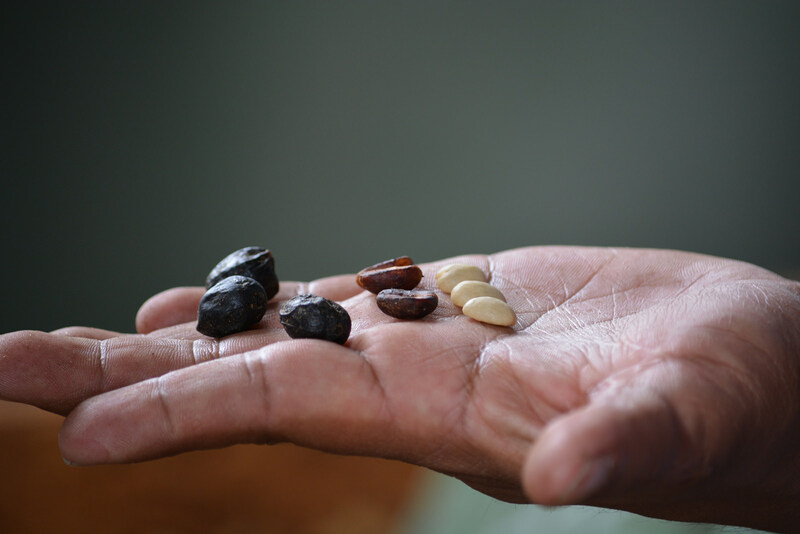 From left to right, three coffee grains of the geisha cultivar, treated by the natural, semi-dry and wet process (Photo: Nicolas Chatel-Launay). Well, we have coffee beans, but there is still some work to do. Not an obligatory step, but dried coffee beans can be aged for some time. Although coffee aging never takes more than a few months, aged coffee tends to be better coffee (at Casa Ruiz, aging takes 4 months). After aging, the third and last protective layer is removed. The bean can also be polished at this stage. Beans then get sorted by colour, size, density and shape. The later three are crucial steps, because if you try roasting two coffee beans of unequal size, one of them will burn, and your cup of coffee will taste awful. Beans with a different shape, size and density are all used, but it’s important that in a given bag, all beans are as similar as possible. Beans are all packaged and shipped around the globe. 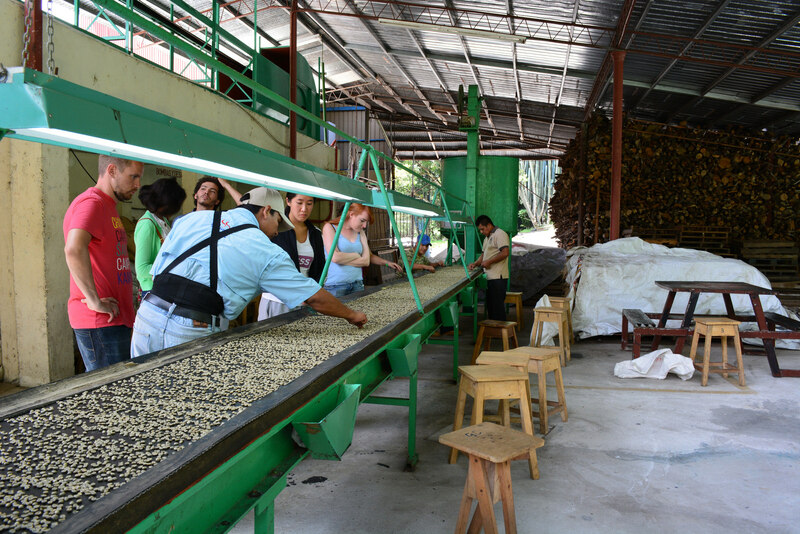 At Ruiz, some beans are roasted on site for the local market, but most are exported as green coffee. Once the beans arrive in their country of destination, beans are roasted (they can be decaffeinated just before, but I personally consider that a crime). Even if grains are sorted by size and density using machines, shape and colour are still judged by eye (Photo: Nicolas Chatel-Launay). 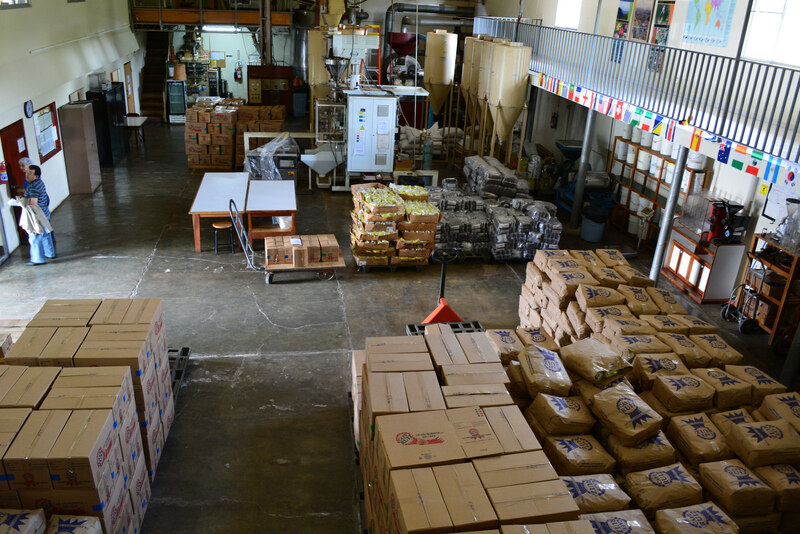 A view of one of the warehouses of Casa Ruiz, one of these boxes is headed for Taiwan, the other is off to Japan (Photo: Nicolas Chatel-Launay). Roasting is important. A light roast coffee (195-205°C) will keep a green, fruity taste while having little bitterness. A medium roast coffee (210-220°C) is more balanced, that’s what most Panamanians and half of North Americans drink. A dark roast coffee (225-230°C) is almost burnt, it becomes more smoky and bitter, that’s the other half of the coffee drank in North America and by a good proportion of French citizens. Finally, you get French roast (240°C), Italian roast (245°C) and Spanish roast (250°C): that coffee is just burnt. If you like bitterness and smoke, it’s bitter and smoky, but there really isn’t much of a taste left, and not much of the producing region’s particular flavours. By the way, if you want stronger coffee, but not bitter coffee, DO NOT buy a darker roast. Simply put more coffee grains in the same amount of water. Also, the darker the roast, the more degraded the caffeine and the less it will wake you up. So if you think buying French roast will make you more alert, you are completely wrong. That’s it, you got a coffee grain ready for use. You can buy it in grains and grind it at home. How fine to grind it will depend on the type of machine you are using (percolator, drip, expresso, French press, etc.). You can also buy your coffee already ground but… a lot of companies will mix in pulp from the berry, leaves and even branches of the coffee shrub. Sometimes they even add totally unrelated plants. Cheap coffee is not weak due to a lack of roasting, it’s weak because they don’t put a lot of powder and it’s not all coffee. Even a proud house like Casa Ruiz does market the twigs. They sell them to other coffee brands that mix it in their ground coffee. Basically, if you want to drink coffee from coffee beans you should really contemplate the idea of buying a coffee grinder and grinding your beans yourself. Furthermore ground coffee loses its flavor fast when exposed to air, so you should only grind the quantity you are going to use on that day. Alternatively, you can put your ground coffee in the freezer, it will slow down the degradation process. Don’t bother if you’re drinking Nabob, or Maxwell House or Folgers, or worst. Most of it is not coffee anyway. A good coffee should be prepared with water around 95°C. So that’s it, you got a lovely, heart-warming, cup of coffee. You feel ready to pull an all-nighter. But, why exactly do you feel less tired? That would be caffeine. Why do the coffee tree, the tea shrub and other plants produce caffeine? To start with, it paralyzes and kills a wide array of insects if they try feeding on the plant. Interestingly, small quantities of caffeine can be found in the flower nectar of these plants. It has been shown that the caffeine in those flowers increases the memory of bees and helps them remember the location of the plant so they can tell the rest of their colony (by dancing, yes bees are awesome) how to get to the plant in order to pollinate the other flowers. So caffeine is actually quite useful for plants. The molecular structure of caffeine (Image: Wikipedia Commons). Unless you’ve got something to tell me, you are a human being. Caffeine will not affect you as it does an insect. Caffeine, a crystalline xanthine alkaloid, will stimulate your central nervous system by blocking adenosine receptors. Adenosine is a neurotransmitter that inhibits neuron activity. So basically, caffeine’s main effect is to disconnect the break system of your brain. On top of this, it also affects many neurotransmitters and hormones such as dopamine (reward feeling, alertness), acetylcholine (muscle action), serotonin (happiness), norepinephrine (vigilance), epinephrine (fight or flight response), glutamate (memory), and cortisol (stress). For a more detailed example, high doses of caffeine reduce the GABA (γ-Aminobutyric acid), which leads to anxiety, insomnia, rapid heart rate and rapid breathing. If you like chemistry, caffeine is great stuff! More generally, drinking coffee will make you more alert and more vigilant. You will be more focused and will have better muscle coordination. If you are sleep-deprived, it will increase your performance. Moderate doses will improve your athletic abilities in many sports. It can be used to alleviate headaches and is actually used as a drug to treat migraines. It also reduces the risk of developing certain cancers, cardiovascular diseases and type-2 diabetes. Some studies have also shown that caffeine consumption improves long-term memory, but that remains controversial among scientists. Of course, you should not drink too much. Just as its cousin cocaine, caffeine is toxic at high dosage. If you tried to inhale a line of caffeine powder, you would get really, really sick. By the way, in the Andes, people chew Coca leaves or drink Coca tea. In such quantities, cocaine has very similar effects to caffeine and is certainly not dangerous. In humans, the lethal dose of caffeine is estimated at 150 to 200 mg per kg of body weight (cocaine’s lethal dose is a tenth of that). Don’t worry coffee drinkers, that’s about 80 to 100 cups of coffee in one shot. But if you like taking caffeine pills, then it becomes a possibility (tablets tend to be around 400-500mg). The more common side effect of caffeine abuse is addiction. Along with it, you may feel restlessness, anxiety, insomnia, irritability, headaches and heart palpitations. The take-home message is: enjoy your caffeine, but don’t go overboard with it. So that’s it, you just got way too much information on coffee production worldwide and in Panamá, as well as on caffeine. I’d like to thank Carlos who gave us a three and a half hour tour of Ruiz plantations and facilities, followed by a coffee tasting of various Casa Ruiz coffees, all this while being informative and funny. If you get a chance to come to Boquete, it is totally worth it. ← Que font les chercheurs ?